Got a new kitten? Some kittens need to learn how to properly use a litter box. Here's how to litter box train your kitten. Congratulations on your new kitten! One of the very first things you will need to teach your kitten is how to use the litter box. Proper litter box training early on will help your kitten develop healthy habits for life. Your new kitten may or may not already know how to use a litter box. It all depends on how she was raised by her mother. Kittens learn most of their behaviors from their mother over the first six weeks of their lives. If the mother uses a litter box, then the kitten will likely learn this before being adopted into a new home. However, if the kitten was raised outdoors or was separated from the mother too early, she might have no knowledge of litter boxes or even proper elimination habits. This is where you come in and begin litter box training. Your kitten needs an easily accessible litter box, so choose something with low sides that she can easily step into. It should be big enough for her to turn around and eliminate in more than one spot. A basic small plastic litter box can work well. However, you may wish to start with something like an old baking pan or a shirt box with a liner, especially if your kitten is very tiny. Covered litter boxes may or may not work for your kitten. In the beginning, it may be best to use an open box so you can observe your kitten in it. Once your kitten learns to use the box, you may wish to try covering one box and leaving the other open so you can learn if she has a preference. Some cats prefer the privacy of a covered box, while others dislike the closed-in feeling. If you have multiple cats, a good rule of thumb is to have one litter box per cat, plus one extra. If your kitten is the only cat in your home, it's still a good idea to have two litter boxes. If your home is more than one story, put a litter box on each level of your home. [post_ads]The type of litter you choose can make a big difference in how well your kitten takes to the litter box. The texture of scoopable litter is generally preferred by cats over the larger non-scoopable clay style. Unscented litter is best because perfumes can overwhem your kitten's sensitive olfactory system. Be aware that some kittens will eat cat litter when they are first introduced to it. This can lead to dangerous gastrointestinal problems. For this reason, you may wish to choose a corn or wheat-based scoopable litter. You may wish to get a mat to place outside the box to catch litter pieces. Make sure you choose something that will feel soft and comfortable on your cat's paws. Rough or spiky surfaces are likely to deter your cat from entering the litter box. The litter box should be placed in a private yet accessible area of your home. Avoid cramped spaces like under cabinets or in small closets. Make sure the box is not next to a loud appliance or something else that makes scary noises. The litter box should not be placed near your kitten's food and water dishes, nor should it be too close to your kitten's favorite sleeping spots. Kittens and cats naturally prefer not to eliminate near their food and beds. Keep the litter box and surrounding area as clean as possible. Scoop the litter box once or twice a day. Immediately clean up any accidents made outside the box. Sweep up stray litter pieces. A clean, neutral-smelling litter box is much more inviting to cats and kittens. A dirty litter box can easily lead to unwanted elimination behaviors, like peeing on laundry or rugs. The litter box area should be all set up before you bring your new kitten home. It is usually advised to start new kittens out in a "transition room" that is safe, comfortable, and can keep the kitten isolated from other areas of the home. This can also really help with litter box training. Set up the food and water on one side of the room and put the litter box as far away as possible. Keep your kitten in the room for the first several days to weeks until she seems comfortable in the environment. Once you let her out to explore the rest of your home, it's best to return her to this room when you are not home. Right after your kitten eats or drinks, place her in the litter box. Do this each time she eats or drinks. You may even try scratching at the litter to show her what to do. If you see your kitten sniffing or scratching the ground, place her in the litter box. If your kitten is peeing or pooping in the room and not in the box, gently place her in the litter box. Do not scold or punish your kitten for eliminating outside the box. This will only make her associate the litter box with negative things and deter her from using it. 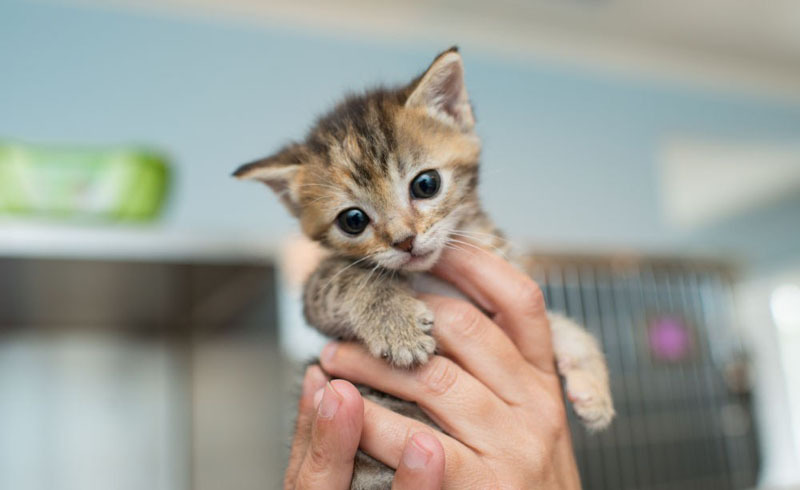 If your kitten uses the litter box, you can praise her with petting or even a toy or treat. First, let her explore the area and make her way out of the litterbox on her own. Don't scoop up the area right away; let the scent remain as a reminder to your kitten later. [post_ads]Most kittens will learn to use the litter box fairly quickly. It may take longer for some kittens, so try to be patient. If your kitten has one or two specific areas in the house where she likes to eliminate, move the litter boxes to these areas. If this does not work, try changing the litter box or the cat litter brand/type. When considering the litter boxes, try to put yourself in your cat's position. Is there something in the area that is frightening or distracting? Perhaps there is a sight or sound that makes your cat want to avoid the area. Maybe the litter box has a strong plastic smell to it. Perhaps the litter does not feel good on her paws or has an odor she dislikes. You may need to make several small changes before she will accept the litter box. Remember, never punish your cat for accidents. Be consistent about moving her to the litter box if you catch her in an accident. Try not to get angry or frustrated. Stress in the environment is the main cause of behavioral litter box issues. This means you may need to assess your kitten's environment. Are there other pets in the home causing stress? Is your kitten acting anxious or restless? Perhaps she needs more exercise and/or vertical space. If you continue to have trouble, talk to your veterinarian. Not only can your vet rule out health issues that might be getting in the way of litter box training, he or she can also offer training suggestions.